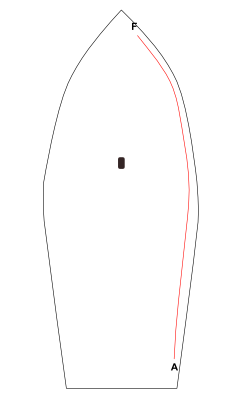 Jacklines are an essential part of any sailboats safety equipment. Ours are made using 9800 pound breaking strength flat low stretch polyester webbing which has been treated with NanoSphere® technology which provides better life to the webbing. A generous sized 12" loop is sewn in the forward end of the jackline for attachment to a cleat or pad eye designed for the purpose. The aft end of the jackline has a smaller loop so that you can attach it to the aft attachment point using a lashing which allows you to fine tune the length. Flat webbing is the best product for jacklines since it will not roll under foot. It provides great UV stability and the yellow color is a good contrast to most deck colors. Each jackline is made to order to properly fit your boat. We will need to know the length you require which is measured from the forward attachment point around the cabin and shrouds to the aft attachment point. The jackline needs to lay flat on the deck. These are normally purchased in pairs although if you need to replace one, we can make you one. The forward attachment point is labeled "F"
Aft attachment point is labeled "A"
Since these are made to order please give us a call at (253) 627-6000 and we can get your order started. This product can not be ordered online. We can also make jacklines in a less custom version with the large loop on the forward end and nothing on the aft end. This works if you are using a strong cleat as your aft attachment point and you allow plenty of webbing to "cleat it off". This design is what you would find at most mass merchants although many use 6000 pound breaking strength webbing where ours are 9800 pound. The added strength allows for longer life. We also use a contrasting thread color so it is easier to examine the condition of the stitching. The ISAF regulations specify that jacklines must be constructed from material with minimum breaking strength of 4700 pounds (the same as 5mm 1X19 stainless steel wire rope). US Sailing recommends constructing them from "20kN (2,040 kgf or 4,500 lbf) min breaking strain webbing". Our jacklines exceed these requirements, the complete assembly has a minimum breaking strength of 4700 pounds where ones made to the minimum ISAF standard would be much lower due to strength loss due to stitching, splices or other end terminations. We charge a $35.00 labor fee for each jackline plus the cost of the webbing which as of August 2015 is $1.54 per foot. So if you want 2 jacklines that are each 30' in length your total cost would be $162.40 ($92.40 for the webbing plus $70.00 labor).